Will 2016 Be The Breakthrough? On behalf of everyone at AE911Truth, I would like to express our heartfelt gratitude for your commitment to our common cause. Because of you, we have made more critical progress toward our mission this year than in any of our previous eight years! 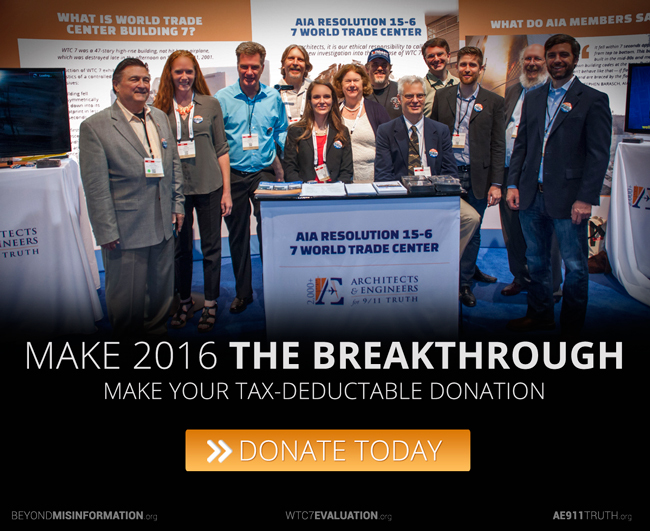 From launching WTC 7 Evaluation to distributing 50,000 copies of Beyond Misinformation to mounting our first AIA resolution campaign, our many recent accomplishments leave us poised to make 2016 a breakthrough year. Please make your yearend tax-deductible donation today and together we’ll build on an incredible 2015. I wish you the very best in the new year!